I love how this turned out. From graphics tool to a game in its own right! Thanks! Watching you play the game was very instructive! I'm sorry the controls weren't more clearly explained, a tutorial or help page is definitely on the 'to do' list once the competition is over. The big concept I can see wasn't explained to you is that you are actually swapping colors around the image. 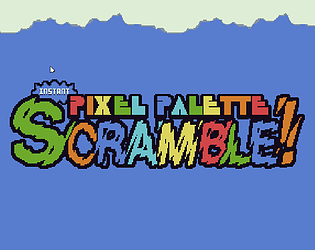 So the process is select color A, then color B and then they will swap pixels. That's why the image keeps changing on you as you click around. Finally, I wanted to ask what size window you played on? I noticed the 'High Score' text came up over image at times. This won't happen if the window is larger. But it's totally possible I forgot to set the default window size large enough. Ah that makes sense! I dont know what happened. The game opens at 800 x 600 for me, automatically. Probably one of the best games in this jam! Very fun, though the images were a bit too complicated and the time to look at the image was very small. I would also recommend a help page because it took me a while to figure out the controls. I have a laundry list of improvements to make once the competition's over and 'help page' or 'short tutorial' is definitely high on there! About the images being too complicated, one of the other improvements is to sort and present the images by difficulty. I actually have this working but switched back to full random before submitting for the jam because I rand out of time searching for images that were simple enough to work with the concept. With the small set of images I used in the Jam build, if I sorted by difficulty, you'd be playing the same images over and over. Hence, a corollary improvement is to add more images to the collection. Anyway, sorting by difficulty definitely adds a nicer sense of progression to the game and helps ease you into the more complicated images.